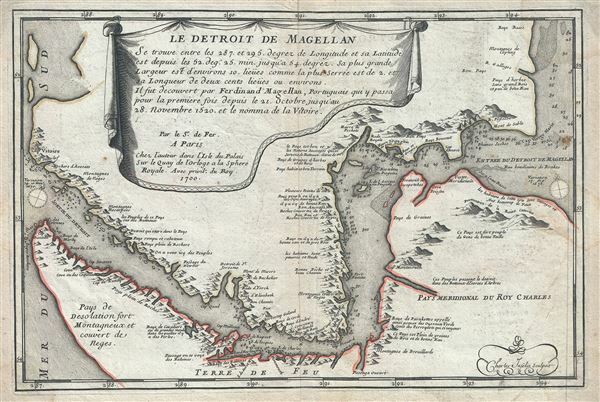 This is a scarce 1700 map of the Straits of Magellan, South America by Nicholas De Fer. It covers the important strait located at the southern tip of the South American mainland, just north of Tierra del Fuego. The map renders the region in detail, noting the coastline, capes, coastal features, soundings and other important navigational features and topography, with mountains beautifully rendered in profile. The Strait of Magellan was discovered by the Portuguese sailor Ferdinand Magellan, the first explores circumnavigate the globe, in 1520. This natural channel linking the Atlantic and Pacific Oceans though a challenging route to navigate (given the unpredictable winds and currents), is the fastest connection between the two oceans. This map was engraved by Charles Inselin and created by Nicholas De Fer for his 1701 Atlas. Very good. Minor wear and toning along original centerfold. Minor dampstains near edges and margins. Light offsetting.